We aren’t trying to plant any rebellious ideas in your head. Not at all. Recruiting is as intense and busy as it is fun and rewarding. And at the end of the day, you walk out knowing you have made a difference in somebody’s life. But if you were to leave your job and switch careers, we’ve got a pretty good guess what your next job would be. We recently analyzed the profile data of 94 million LinkedIn members, and identified the most common career transitions across different industries. 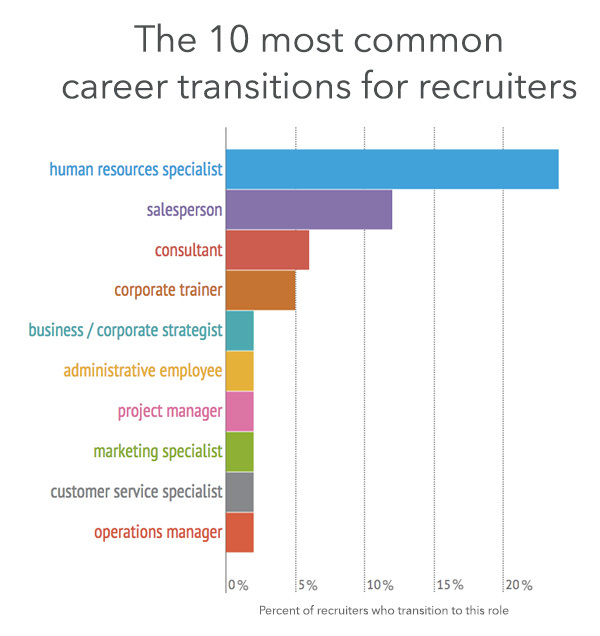 Note that going from being a recruiter to an HR specialist is by far the most popular move – it accounts for 25% of all transitions. The second most popular move, to sales, accounts for 11%. As you go farther down the list, these transitions become less and less common. Do you think these moves make sense or were they surprising? Colors represent careers that lead to similar transitions. The size of the dots represents the number of careers that transition into this role. The thickness of the line represents the number of LinkedIn members who have made that move. All roads lead to sales. Leaving a job to start a career in sales was by far the most common career transition. Next time you recruit for a sales role, don’t ignore candidates with no previous sales experience – you may be severely limiting your talent pool. Veterans have the most varied career paths. While this is not surprising, it’s inspiring to see the breadth of skills that veterans possess. To give you a taste of the diversity, a few of the roles that military members transition to are police officers, business owners, and corporate strategists. Specialists are least likely to change careers. Our data shows that people who have spent a lot of time and energy specializing in a narrow field are less likely to switch jobs. Doctors, lawyers, and software engineers all fall into that category. It’s safe to say that even a nice sales job won’t sway this demographic. 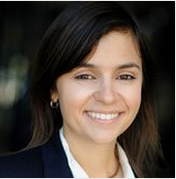 This research is part of LinkedIn’s efforts to map out the global economic graph. From there, we looked for instances where a member’s current career category is different than the career category in the position immediately preceding it. Members who hold multiple current careers or indicated multiple career transitions were excluded from our analysis. Finally, the most common transitions for each career were isolated and displayed in the graph above. A clustering algorithm was utilized to color and position the career dots, based on their degree of overlapping transitions.